Mary Elizabeth Williams, a mom of two girls, and writer from New York, was doing what moms do -- juggling laundry, making meals, helping with homework, working, and navigating a recent separation -- when in the summer of 2010, she was blindsided by the news that a little scab on her head was actually malignant melanoma. Her malignant skin cancer diagnosis was the beginning of a story that mingles the power of science, friendship, love, and cancer, she told CBS News -- a story she turned into a book, which comes out today, called "A Series of Catastrophes & Miracles: A True Story of Love, Science, and Cancer" (National Geographic, April 2016). Q: Can you share a bit about how your inspiration for the book began? A: I was 44 at the time and I discovered a little bump on the top of my head, a little scab, and didn't think anything of it. And I went to the dermatologist and it was biopsied and it was malignant cancer. I lost a giant portion off the top of my head and went through recovery and thought I was in the clear, and then a year later, I was re-diagnosed and this time the cancer had spread into my lungs and soft tissue. Typically, what would happen to someone with late stage melanoma, even five years ago, the trajectory was very bad. My cancer was progressing rapidly. Q: Did you start facing your own mortality -- planning for your death, getting your kids mentally prepared? A: Yes, I went to that scary place, planning for my family and not being there. But I also had to do the laundry and get dinner on the table. Q: You went to Sloan Kettering in New York for your medical care and they recommended an experimental treatment when your cancer returned a year later, this time in your lung? Q: Did you get a sense that the treatment was working or were you surprised to learn your cancer was going away? I thought maybe this is a good sign. Twelve weeks into the trial, I saw my scans were cancer-free and I think my cancer disappeared well before that. 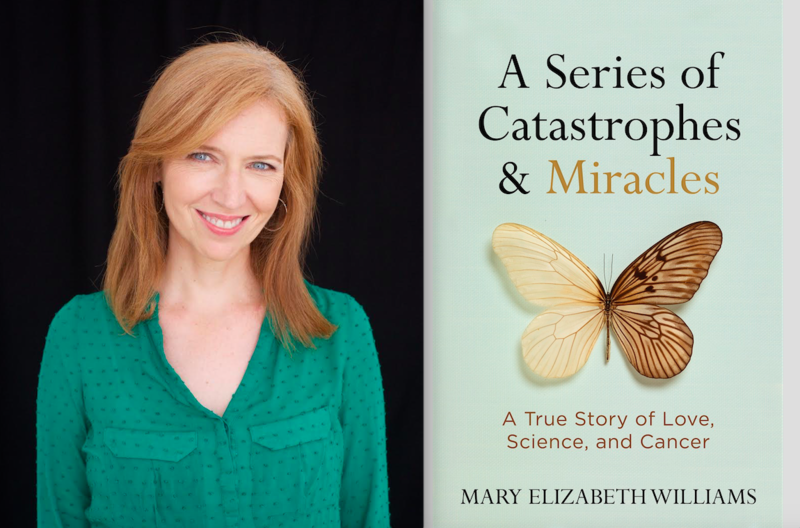 Q: The title of your book refers to "catastrophes" and "miracles." Are you a spiritual person? A: I am a religious person, but I always say that I don't believe in a God who hands out favors. So I didn't think God would save my life, but would instead get me through my life. I was saved by science. Q: A good friend of yours was not as lucky. But the book shows how you really helped each other through the days and months - whether it was mundane issues or scary treatment issues. You talk about the power of laughter. A: One of my best friends, Debbie, had ovarian cancer at the same time. She was one of the funniest, most defiant and raunchy people I've ever met. She was a huge part of the whole experience. We went through a lot of it together and laughing really hard -- we always have kind of laughed our way through everything. I don't know how people who don't have a sense of humor get through terrible things. If you can't find those little moments of grace and absurdity and comedy in the midst of it, I don't know how you get through it. For us, it was like when you get married and there is this difference between you and your friends who aren't married, or when you have kids and there are still those who don't. You keep going through smaller and smaller doors that basically no one of our other old friends had gone through, and I felt there was a new kind of intimacy. There was a new closeness between us, but when I got better, a new distance too. Q: You tell a story about a funny moment with your husband. There is a part of the book that I'm really looking forward to doing at readings. I was on opioids after my surgery and having a very typical physical side effect [constipation] and I asked my spouse go to the drug store and pick up something that would help me. He came back with a full case of fleet enemas. It was this grand romantic gesture -- his way of trying to help. Q: That's another element of the story. Your marriage, your relationship, changed a lot. Our story was so strange. We had separated and I really thought that our marriage had ended, but we had just decided to take a chance to get back together. And really had a nice honeymoon period and then first, his dad was re-diagnosed with terminal cancer, and then I got diagnosed. It was just a whack-a-doodle summer. The thing we had in common: We both wanted to be there in this experience. It was part of what had broken us up -- the issues with commitment and obligation. He was like a lot of people. He had never really been really called to step up in this way, and suddenly, he did it. He was the guy who stepped up and took care of the dinners and arranged the play dates, and I saw this side of him that was really impressive. To see this part of him that really stepped up in this new and intense way and didn't back down and wasn't afraid. Q: You're cancer-free now. Do you guys still talk about your experience with it? Has it changed your family dynamic? We talk about it all the time. My kids are right this moment participating in a day camp for kids whose families are experiencing cancer. My older daughter who is 16 is one of the counselors. She is doing service for younger kids who are maybe just coming into cancer. It's at Gilda's Club. They have this amazing program. Seeing my kids turn around and understand how to be empathetic and how to give service and how to speak to other kids about this -- to see the kids give each other this level of support and understanding that we as adults can't do for them. Everybody goes through something, everyone has their pain, their struggle, and we want to teach our kids that it's the reality of the world. Protecting them from realities that may be going on in your life and family will teach them that things are unspeakable and that things are shameful and that there are things they're not privy to, and that messes with their ideas about trust. Not that I think I performed perfectly 100 percent of time, but I know in my heart I'm so glad and proud when I look at my daughters. Q: And do you teach them the practical things, like using sun block to reduce their chances of getting melanoma? My kids are as pale as I am. We try to take reasonable precautions but I also know people are able to walk out in the world and be okay. If you spend all your life afraid, what is the point? We go to the beach for a week every summer. I was just in Los Angeles for a week riding around in a convertible with a friend. I'm not going to sit in a tanning salon or lie out on the beach and get a tan, but I'm not going to stop living my life and wrap up like a mummy. That's not joyful. I want to model joy for my kids. Q: Your father-in-law and Debbie didn't survive their cancers. How do you come to terms with losing them and with your own survival? I miss Debbie so much and I'm mad she didn't live. I wrote the book because I really wanted to tell a story that makes it clear that there are amazing things happening in cancer therapy and also that not all survive, and not because I did anything better or more wisely. Survival can be really random. I'm so tired of reading stories of someone who lived through cancer and believes that it's her own triumph. It's all about the science. It helps to have love and support but it really comes down to science, your genes and your body.